Cage 2 antenna for the intermediate waves (1,8 - 2,8 MHz) between the masts 7 and 6 used for TX14 and TX15 transmitters (messages: 670 and 671) of the sending station in Middelkerke. This cage antenna between the masts 7 and 6 of 65 m height was equipped with a tuning circuit (messages: 708 and 709) in order to increase the wavelength. The sight is taken on the 'Koninginnelaan" (Queen avenue), who is the principal road along the coast of Flandres, known as Royal Route, of Ostend in direction of Westende and France. Sight from the Dr. Hector Verhaeghelaan (Dr. Hector Verhaeghe avenue) on the 65m high antennas of the sending station in Middelkerke. On the left, the Dipole 1 antenna between the masts 1 and 2 connected by mast 1-2 to the transmitter Z14 (1,5 - 9 MHz). 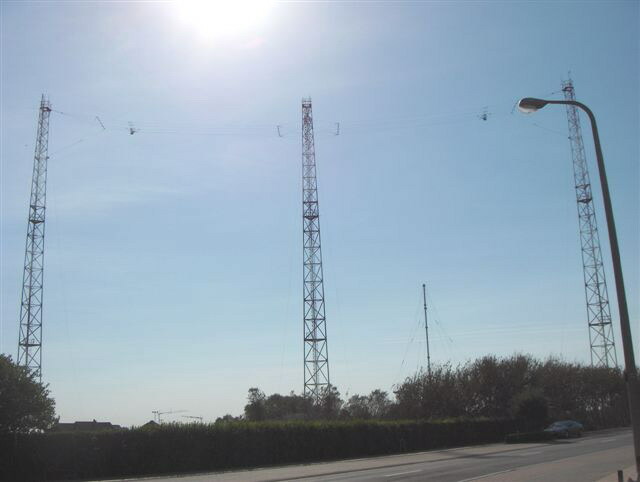 On the right, the Cage 2 antenna between the masts 7 and 6 for transmitters TX14 and TX15 of DSC (1,8 - 2,8 MHz). Sight since the last villa on the "Dr. Hector Verhaeghelaan" (Dr. Hector Verhaeghe avenue) of the sending station in Middelkerke. On the left, sight of the Dipole 1 antenna (Masts P1 and P2) of the Z14 transmitter of medium and short waves (1,8 - 9 MHz) and on the right, the P7 mast of of the Cage 2 antenna for intermediate wave (1,8 - 2,8 MHz). Sights respectively from left to right of masts 3 (55m), 6 (65m), 4 (55m) and 5 (55m) of the sending station in Middelkerke. General sight of the main buildings of the sending station in Midedelkerke. With beyond the buildings, the mast 1-2 of the Dipole 1 antenna of the Z14 transmitter (1,5 - 9 MHz). On the right, the mast 2 (65m). Antenna TG1 for medium wave (435 - 512 Khz) of the sending station in Middelkerke, currently used with the Z60 transmitter for NAVTEX transmission on 518 Khz. In the centre, from left to right, the room of the cage antenna and the old cloakroom of the soccer club “Goldstar” currently now the chicken house of the caretaker of the sending station and beyond of this one, the antenna Reuse 1 of the Z10 transmitter for short waves (1,5 - 28 MHz). Sight from the "Dr Hector Verhaeghelaan" (Dr Hector Verhaeghe avenue) of the masts 3, 4 and 5 of 55 m high of the medium and short wave antenna (1,8 - 9 MHz) of the sending station in Middelkerke. Sight from the Dr Hector Verhaeghelaan (Dr Hector Verhaeghe avenue) in direction of Oostende (Ostend) of Cage 2 antenna (Masts P7 and P6) for the intermediate waves (1,8 - 2,8 MHz) of the sending station of Middelkerke. Overall picture of the antennas of the sending station in Middelkerke since a walkway of the natural reserve of the dunes. In the front of the picture, the masts 5, 4 and 3 of the medium and short wave antenna (1,8 - 9 MHz). Sight from the natural reserve of the dunes of the short and medium waves antennas of the sending station in Middelkerke. 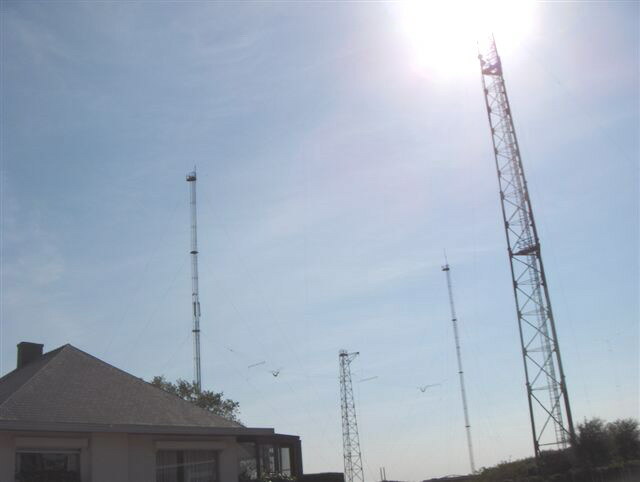 In the front, from left to right, the P5 , P4 and P3 masts of 55 m high of the medium and short wave antenna (1,8 - 9 MHz). Beyond, from left to right, the P6 mast of 65 m (close to P4) and the P2 mast of 65 m.